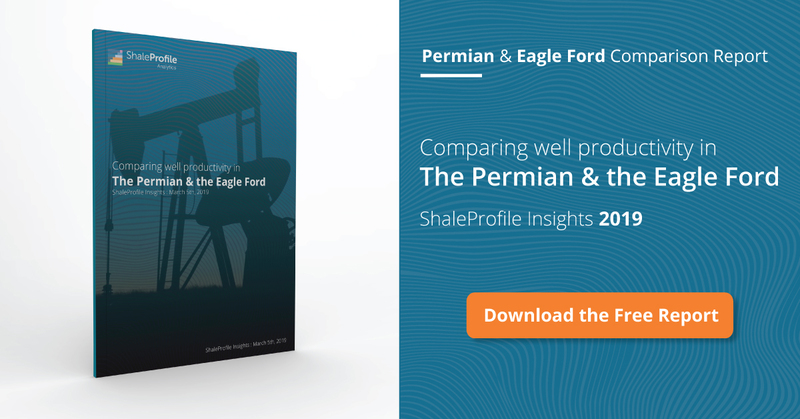 This interactive presentation contains the latest oil & gas production data from 18417 horizontal wells in the Eagle Ford region, through August. As you can see, oil production in the Eagle Ford has declined very steadily over the year, and reached a level in August last seen 3 years earlier. If you switch to product “gas”, you’ll see that gas production has also declined recently, although less sharp. 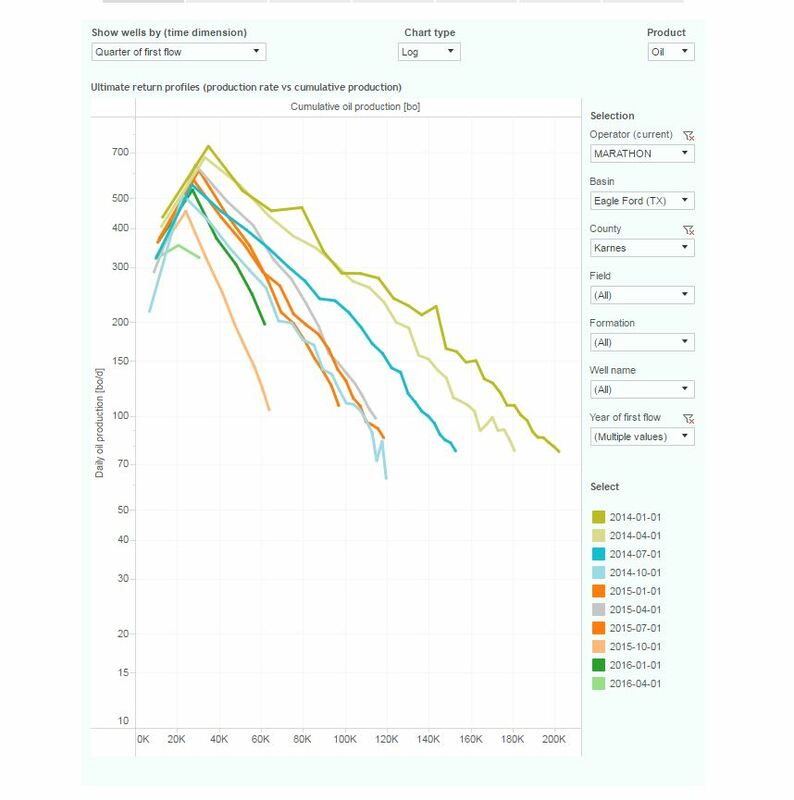 In the “Well quality” tab, we can see that production profiles have on average not changed much in recent years, apart from an early gain in the first year on production. The bump in production (enlarged due to the logarithmic scale) in the 2011 vintage is likely caused due to a refracked older well. After selecting the “Top operators” tab, you’ll notice that the top 5 operators have all reduced production during the previous 1.5 year. However, the decline in output from the other operators is larger. This first overview shows the path that wells from a certain period are taking towards their ultimate return. The wells are grouped by the quarter in which they started. By clicking through the legend, you’ll get a better idea of how these profiles have changed over time. Also here you can switch to gas (using the ‘product’ selection at the top right), to see towards which ultimate gas return these wells are heading. Note that this data also includes wells that are located in other formations than the Eagle Ford (e.g. the Austin Chalk). To filter those out, you can use the “formation” selection, to only include Eagle Ford wells. I now have the detailed location data for most wells in Texas, so the maps in the next couple of views display quite accurately the location of the wells in the Eagle Ford region, and how well productivity is geographically distributed. A new ‘Gas Oil Ratio’ dashboard has been added to the end, which displays how this gas/oil ratio has changed over time in this basin. As Ohio has not yet released Q3 production, I decided to first post updates on the Eagle Ford, and the Permian (planned for coming Wednesday). Texas RRC. Individual well profiles are estimated from well status & lease production data, as this data is not provided by the RRC. For all the improvement in the Permian, there has been a dramatic chilling drop in the sweet spot of the Eagleford. Marathon Oil Karnes County BOPD versus cumulative oil starting in 2014. That may be part of the explanation of why Marathon shows the steepest drop of the top 5 operators. With regard to the Projections post: I’ve also been thinking about updating that one. This period is a bit busy, but if I see enough interest I may post a new version of that one in the January time frame. It would then include actual production through the first half of 2016, after which the projection starts. The math is pretty easy if we say the average cost per well is $9MM. When you consider all the nonproductive acreage which was purchased, and the frogs that had to be kissed along the way. 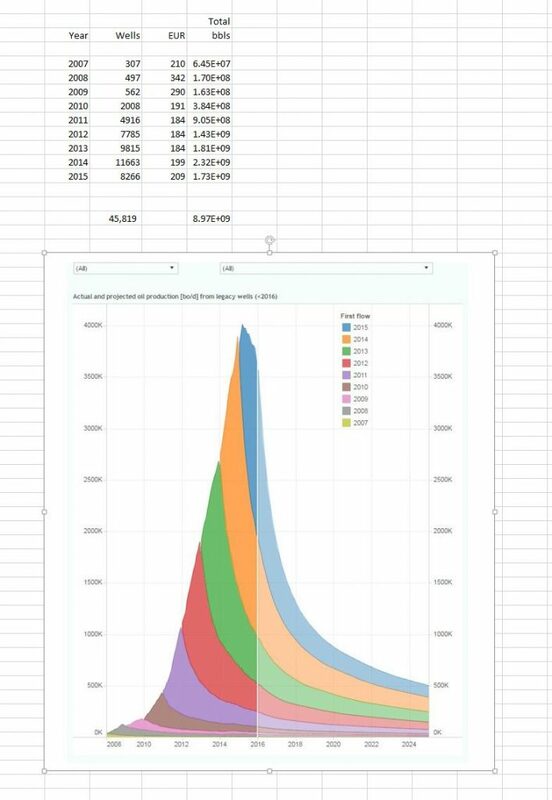 Anyway, you can choose your own average well cost number but with $9 MM over 9 Billion the stoich is easy 46*10 03 wells * 9 10 06 $ / 9 10 09 bbls= $46/barrel. Up it for net and transport and adval/sev from there. Me, I wouldn’t do anything that didn’t have a chance to get twice my money back in 7 years standalone. At Marathon, we used to have a minimum profit to investment ratio of 1.0. Also an NPV/I minimum of 0.8. Been crunching some Enno Numbers- In the first 6 months of this year, 2479 nonconventional wells were added outside of Appalachia. This resulted in a production loss of 353,000 BOPD. Production started the year at 3.907 MMBOPD and at end of Month 6 was 3.554 MMBOPD. Total for the 180 days by my calculation was 671 MM barrels of oil. Now, assume full cycle cost on those 2,479 pumpers average $8 MM. Total to lease, drill complete was about $20 Billion. Take $20 Billion divide by 671 MMbbls oil, I get $29.56 per barrel. Pick your royalty- say average is 0.82, then it “nets” up to $36.04. This probably isn’t a bad approximation for a field price in the first half of the year- the boys weren’t able to borrow money to drill. So, thanks to Enno we know those 2,479 pumpers are making 795 MSTBOPD at the end of June. So, let’s calculate how many more of those kinds of wells would have been required to sustain the 353,000 BOPD we lost. Ratio 353/795 *2479 = 1,100 wells. The added cost would be 1,100 * $8 MM per pop = $8.8 Billion. The $8.8 Billion to keep production flat divided by flat production (3.907 MMBOPD * 180 days) is another $12.52 per barrel. Netted up would be $15.27 per barrel WTI. So, another estimate of what FIELD oil price is needed to keep production flat would be $36.04 + $15.27= $51.31 per barrel. It is interesting to note that we lost 244,000 BOPD from the peak (4.127 MMBOPD) during 2015. I know the annual WTI average price was close to $50 but I have no idea what the average field price received was for this play mix. Notice that I didn’t include gas in my numbers, GOR varies from 1.6 MCF per barrel in the Bakken to 5 MCF/bbl in the Eagleford, so grant me the assumption that gas pays operating cost, but I bet in most cases it doesn’t. The symmetry of this curve is just gruesome! It’s a matter of time before the Permian topples over seriously. And than the whole US shale is coming down. I don’t consider symmetry a good predictive model. Given both the rise in rigs in the Permian, and an increase in well productivity, a near-term collapse seems unlikely..
Good number crunching, Jim! Enno’s website reflects the true power of cloud data! Eagle Ford just features highest IP, fastest drop rate for oil — note gas production is like shale gas in the Marcellus, slow drop after 4 or 5 years. The chemistry/physics behind this is that oil dissolves with kerogens/bitumens in the shale, and could not get out as easily as methane and ethane. While, methane and ethane could get out more steadily after pressure drop with so called Knudsen diffusion. Bakken’s much less kerogen nature has slower drop rate for oil and hence better GOR ratio favoring oil in the long term.